LoveToKnow Antiques recently had the exciting opportunity to speak with Penny, owner of Hoof Prints: Antique and Unusual Equestrian Prints. She is an amazing woman of passion and purpose, who has created a niche gallery of equestrian art that no horse person should miss. In talking horses and dressage with her, LoveToKnow was impressed again and again with her love of horses and the commitment she has to preserving old engravings and illustrations. She has an admiration for the trainers in previous centuries who held to gentle horsemanship techniques in an age that could be rather barbarian. The chronicles of their lives, and training techniques are preserved at Hoof Prints Studio. Penny's studio is in the lower level of her home in West Chester, Pennsylvania. She is an avid horsewoman, riding her horse, Jester, in dressage. Penny bought Jester as a four year old, from a racetrack. He is now twenty-three. "Both of us need time to get our muscles working, now." Penny says, "It isn't like when we were younger. Both he and I work with each other. It's a partnership. He didn't take naturally to dressage, and there are things he has to really work at. I am grateful he was more difficult though, I understand more than I did. I have grown with him." 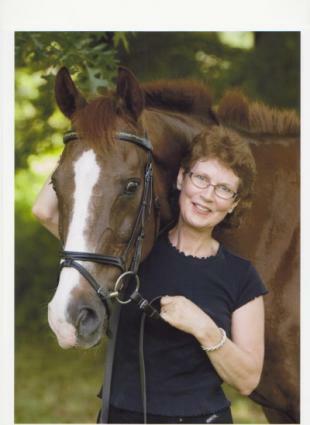 Because of her passion for dressage she attends many events, as well as trade shows. It was during one of these trade shows, ten years ago, that she began a life-long commitment to preserve the past. "I was at a trade show", she laughs, "and I fell in love with an engraving." LoveToKnow: What is it that you look for in an engraving? Penny: Oh, you see something new every time you look at it, don't you? They tell a story. Perhaps you see some background, a castle or the stables, that tells you about the horse's life. You can see what he (the horse) is thinking, and some of his personality. The way he holds his head or the look in his eye, you know a little about him. Today he did not want to work with his trainer, perhaps he has been mischievous. You can see it all in the engraving. Horses are such amazing creatures, such generous creatures, aren't they? They just give so much. LoveToKnow: Tell me, Penny, who are your clients? Who would purchase an engraving from Hoof Prints: Antique and Unusual Equestrian Prints? Penny: They are horse people, of course. These are people who not only love horses but know them. They can tell if the foreleg is in an impossible position, if there is bad conformation, and they know if the neck is held incorrectly. My clients are not interested in a green and burgundy picture to go in their library, but something that speaks to them. Either the horse depicted must have perfect conformation or a horse person, a real horse person, will not buy it. The exception is whimsy. Sometimes a whimsical picture will sell if it has a certain appeal. LoveToKnow: Penny, what about your engravings? Where do they come from? Penny: These old books were written by people who were the most respected trainers and horsemen of their times. They, like John Lyons, held to the theory of gentle training methods. The books were treasured. The papers were made with rags, so they were naturally low acid. Wood has acids that cause foxing and deterioration over time. The quality of the rag papers has preserved the beauty of these engravings. The families that owned and collected these books treasured them and passed them down through the generations. They were taken care of, and have remained in beautiful condition. The engravings are labor intensive. The people who did them took pride in their work, and you can see that, can't you? LoveToKnow: You do carry some original art by modern artists. What convinces you to carry an original painting? Penny: It isn't the artist, is it? It is his work. It must be realistic. Again, the horse must look like a horse, not to the layman, but to a person who works his horses daily and knows their structure. It must tell a story, show the personality of the horse. There is nothing more beautiful than a soft, well balanced horse. The painting must appeal to me, and that isn't easy. If it appeals to me, then it will appeal to my clients. I carry what I enjoy looking at myself. LoveToKnow: Penny, do you have a favorite quote? One that you feel is uniquely yours, or summarizes your thoughts? Penny: The quote I most like, which is actually one of the matted ones I offer on the website, is: Where in this wide world can one find nobility without pride, friendship without envy or beauty without vanity? Here, where grace is laced with muscle and strength by gentleness confined. Ronald Duncan wrote that in,"To the Horse". Jester is the chestnut horse that I used as one of the images to go with the quotes. That is him at 20!! If you are lucky enough to live near West Chester, Pennsylvania, go and visit Penny at her studio and chat with her. If not, you can still see the beautiful engravings she carries on the Internet. Speaking with Penny is a warm and friendly experience. She shares her knowledge gladly, without haughtiness, or aloofness, but in a comfortable way. Her sense of humor, dedication to her craft, and intense knowledge of history, art, and all things horse is fascinating, and at the same time, refreshing. If you are fascinated by dressage, horses, and unusual antiques you won't want to miss a trip to the studio, online or in person.